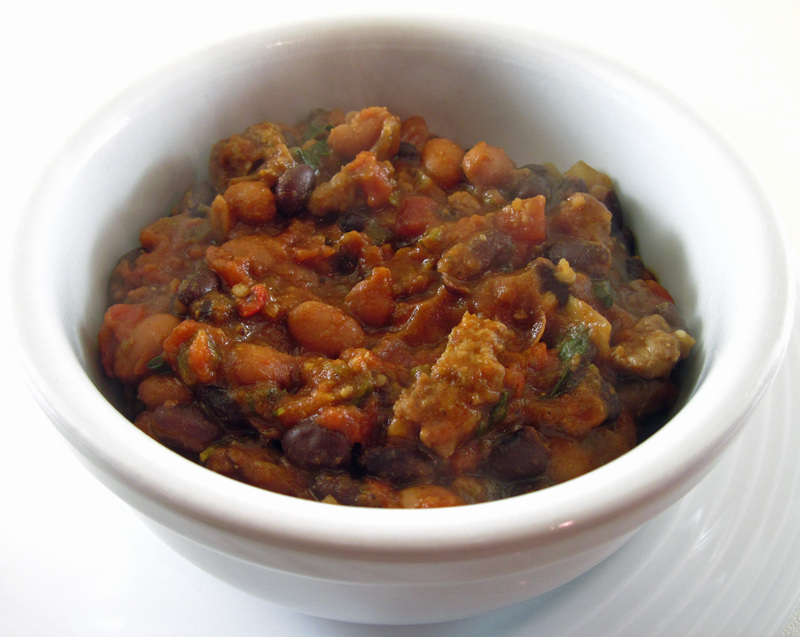 Meet my new favorite chili – Poblano-Chicken Sausage Chili! I used Isernio’s Italian Chicken Sausage instead of turkey sausage simply because I prefer it to any turkey sausage I have tried. Because my poblano chiles are quite hot, I used just one instead of two. The chili was perfect! 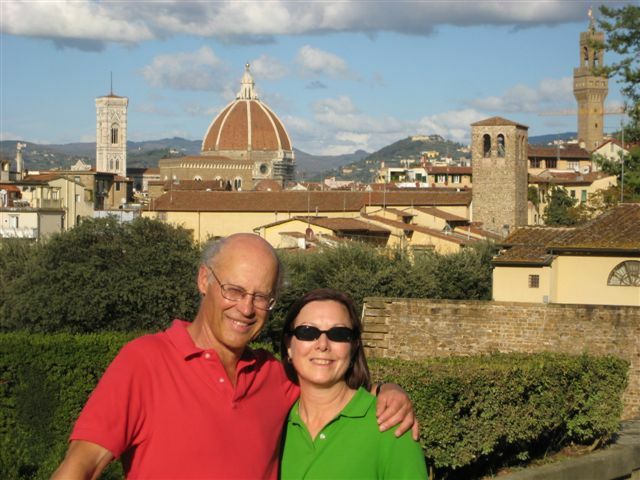 Both Bob and I loved it. I know I’ll be making this Poblano-Chicken Sausage Chili again soon. It’s quick and easy enough for a weeknight dinner and the leftovers reheat beautifully for lunch or another dinner. Cooking Light uses 2 poblano chiles. Mine are quite hot so I just used one. 1. Heat the oil in a large Dutch oven over medium heat. Add the onion and cook, stirring occasionally for about 4 minutes or until it has softened and is starting to brown. 2. Add the garlic and stir for about 1 minute. 3. Add the sausage, chili powder, oregano, cumin, poblano chile(s), and bay leaf. Cook, stirring occasionally for about 4 minutes or until the sausage is browned. 4. Add the broth, tomatoes, and beans. Bring to a boil and then reduce heat to a simmer. Simmer without a lid for about 30 minutes. The chili will thicken up a bit as it simmers. 5. Stir in the cilantro and black pepper. Remove the bay leaf and serve. 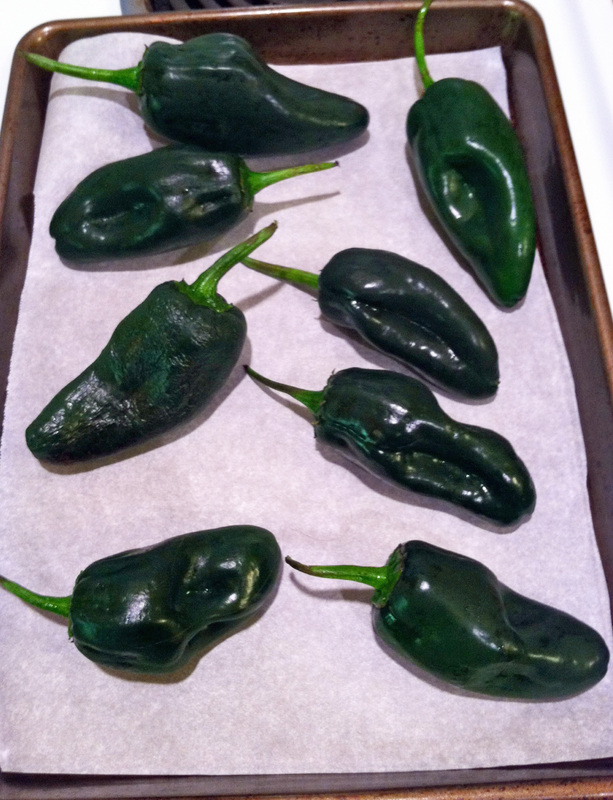 *The Chico Farmers Market poblano chiles ready to be broiled. After broiling them for about 5 minutes on each side (until they were charred), I put them in a bowl and covered it with foil. After they had cooled off, I peeled the skin off, slit them down the side and scraped off the seeds. I then spread them out on a baking sheet and put them in the freezer. After they were frozen, I put them in a Ziploc bag in the freezer. I can now pull out one or two at a time to use when I need them. This looks delicious! I’m always looking for more delicious chili recipes. Thanks! This is a good one, especially if you can get good, spicy poblano chiles. Hi Kath! This recipe looks DIVINE! We would love to have you in our test kitchen soon. Thank you! Your sausage was perfect in it!